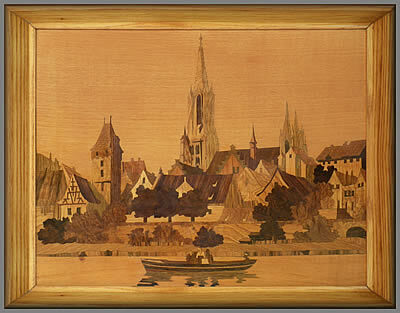 September's update brings you a wonderful selection of of not only several Buchschmid and Gretaux pictures, but also a very unusual French style example of a rather large marquetry (or wood inlay) picture. It is a splendid piece of work and is one we think you will find fascinating and worthy of study. Our September 2010 update brings you a positive wealth of Buchschmid and Gretaux pictures plus a good selection of other works. 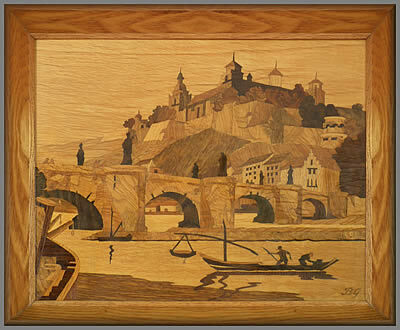 Ed Wortman has had several Buchschmid and Gretaux wood inlay art works residing in his family for well over fifty years. We are showing you a small selection here in our Buchschmid and Gretaux pages so that you can see how well the pictures retain their full glory when kept out of direct sunlight and not subjected to rapid temperature changes. 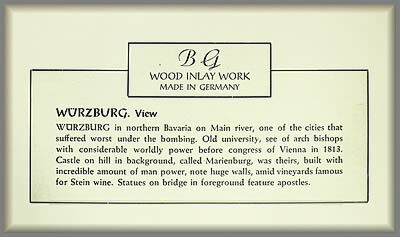 Unfortunately due to various circumstances, Ed is now obliged to have to consider selling these wonderful Buchschmid and Gretaux wood inlay pieces. Ed would prefer to see these works go as a complete ensemble to an enthusiastic Buchschmid and Gretaux collector, rather than have to break up such a worthy group. If Ed’s collection interests you and you would like to know more and wish to negotiate with Ed, get in touch with us and we will pass your request on to Ed so that you can then conduct your negotiations on a one to one basis. 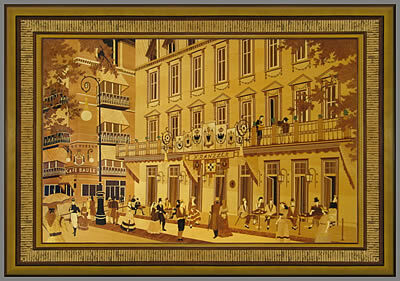 The Marquetry Society does not, and will not, act as an intermediary or agent in the sale or negotiations of any contributor’s marquetry, or otherwise, property unless it has been previously ratified and agreed at an appropriate Executive Committee meeting convened for that specific purpose. We will, on occasions, however feature an interesting piece of marquetry in these pages that, although it is on offer for sale by the owner, has what we would consider interesting qualities we think our web visitors will find interesting and informative. 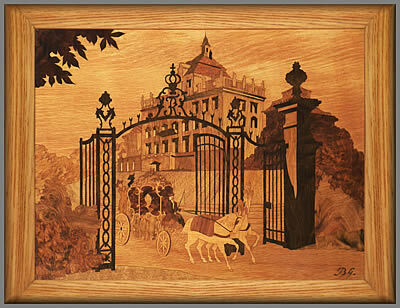 If we do display on this web site a piece of marquetry that its owner has put up for sale, we will mention the fact of the sale as a courtesy to the owner in appreciation of the owner agreeing to us displaying the marquetry piece in question on our web site. Any interest shown by a visitor to this web site regarding such a piece as mentioned for sale, will be simply passed straight on to the piece’s owner via a single e-mail message so that the ‘owner’ and ‘interested visitor’ can conduct their negotiations directly between themselves; other than this simple courtesy, we will play no further part in the ensuing inquiry. We can offer no guarantees as to the true and genuine conditions of the pieces displayed on these pages – you must verify such things yourself with the owner of the piece in question. 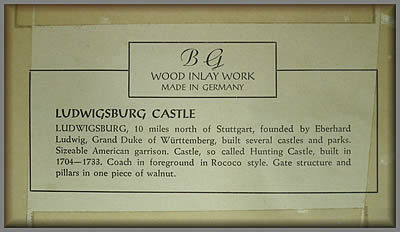 As already stated, we only display the marquetry pieces on an ‘interest only’ basis – and for no other purpose. Other than those specific terms mentioned in our “Please note” statement above, we are afraid that we cannot act as a “shop window” for advertising marquetry or anything else for sale unless it meets the conditions laid out in paragraph 1 of this “Please note” statement. 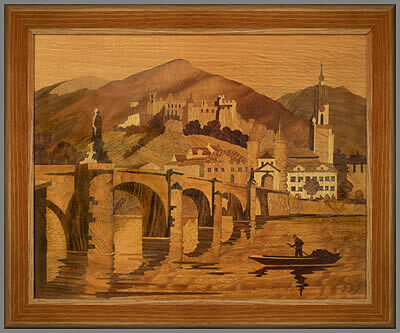 Duarte Oliveira has a superbly large marquetry picture which depicts the Kranzler in Austria. 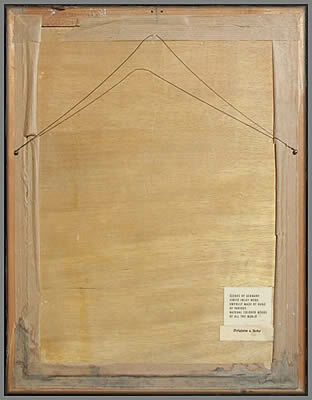 There doesn’t appear to be any artist’s name or initials on the picture itself, or indeed the reverse side. The piece is entirely wood inlay in its make up and is very large. We have to say that we do not recognise the work ourselves – or even the style of the marquetry artist responsible for it. It is very decorative and no doubt, makes a very pleasing addition to an accommodating wall. If any of you recognise it and can give us some information about this rather large marquetry work, we would be very pleased to hear from you. In this instance, it will be you who is enlightening us with your marquetry knowledge! Well, we like to think we are never too long in the tooth to learn something new! Thanks for your help. Our final picture this month is owned by Tim Mullican which, although it could possibly be a Buchschmid and Gretaux wood inlay work, seems rather to be more inclined to the Spindler style. Mind you, this is not to say that it certainly is a Spindler piece; it may well have been made by a smaller company that is, at present, unknown to us. 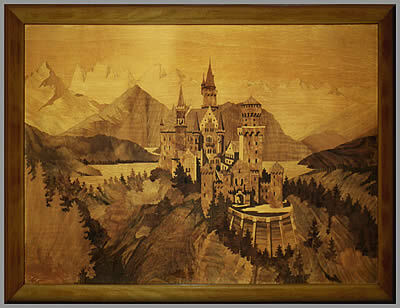 What you have to remember is that between 1900 and approx 1960, there were quite a few small ‘home’ or ‘cottage’ producers of marquetry pieces intended for the domestic home decoration market. These were often very small companies comprised of two or three people who were competent jobbing artists and were trying their hands at a new and potentially lucrative medium. This picture of Tim’s may well be one that falls within this category. Tim tells us that he recently found this old marquetry picture in an antique mall and purchased it for a very nominal price just because he liked it. Tim appreciated the fine detail and work that went into it and didn't think at the time that it would have much value. 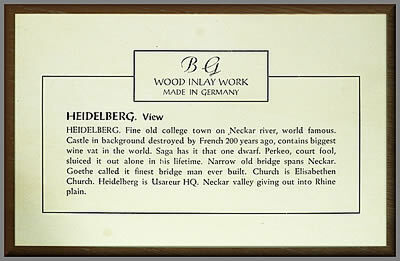 Tim tells us that he believes Befigheim is a town to be found in Southern Germany. Redar may therefore refer to a river in the town. If any of you, our visitors, can enlighten us with information about this picture, we would love to hear from you. Just click on any e-mail link and write in to us, we really enjoy the feedback and information you send us. Thanks for sharing your knowledge and interest with us, it is very much appreciated.
" 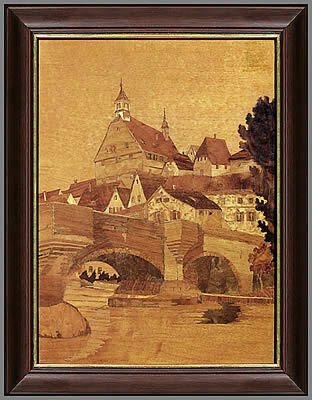 French theme style of marquetry picture"
Click the above button to return to page 27 of "Can You Help"